TradeSmarter, one of the first binary options brokers in the industry, has turned into a trading platform solely. 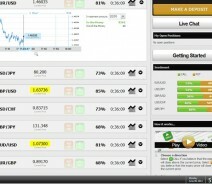 Below are two links to platform reviews, one for the user’s end and one for binary options brokers. As one of the first Binary Options brokers, TradeSmarter not only enjoys being the largest Binary Options broker in the far Pacific, but over the past couple of years TradeSmarter began chunking a large piece from the European Binary Options trading industry. Launched back in 2008, TradeSmarter is a leading company in the Australian Binary Options industry. The platform is currently under advanced process for regulation under the CySec (Cyprus securities and Investment Commission), the main financial regulation body in Cyprus. To read more about this trading platform, click on the link below. Attention traders: This part is for potential brokers. 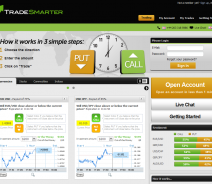 TradeSmarter offers a complete Binary Options solution, powering operators world-wide. TradeSmarter’s solution is an all-in-one package, offering trading platform, mobile, CRM and more. Tradesmarter offers their proprietary software, a fully integrated back office and trading system, while also allowing brokers to distinguishing themselves from the competition with several methods of customization. Business and entrepreneurs seeking to found a new binary options business, you might find this link below useful. Can you tell us if this is true because I heard they mention their platform is good. Some proof will be good . We took over plusbinary.com who was operating using their technology. it is the worst technology provider, and we are working hard to move to a better tech proVidor like tradelogic, Leverate or anyone else as long as it’s not them. Tradesmarter has changed it’s name to Optionsmarter and now has a registered office in Cyprus. I am starting to worry that it is a scam, are those just only software bugs on the new website or is it difficult to withdraw your money????!!!! What’s up, I want to subscribe for this weblog to take most up-to-date updates, so where can i do it please help. I opened an account 3 days ago and placed a few trades.When I logged in again I got message that my account was frozen.I was requested to upload I.D.which I tried umpteen times.I even emailed.Got no response,tried calling 8/10 times,was answered by machine and left my contact details as requested.I also tried getting response via live chat to no avail.Not impressed with customer service at all.Cannot get any response from them. Very solid broker, but yes they’re lagging behind other brokers due to their limited platform. It’s been some months since I’ve started my BO trading with them but right now I feel I need more options than they offer. I am still trading with Tradesmarter , I had few problems because of no previous knowledge of the markets and the support was really helpful. I read the review and the fact that tradesmarter is a trusted broker make me feel like I did the right choice, lucky for me! I will agree that they could upgrade their 1 hour options to shorter periods as offered by other brokers. Nevertheless I will stick with them in the hope they do improve this.